The B-52 bomber, one of the great stalwarts of America’s military arsenal, is getting its first major communications system upgrade since the Kennedy administration. Yes, the high-flying, long-distance bomber is finally ditching its old-school cathode ray tube, green-on-black screens for full-color LCDs, and it’s getting a suite of upgrades that will make it an even more formidable weapon in the skies. The Boeing B-52 has been the United States’ preeminent strategic bomber since it entered service in 1955. The B-2 Spirit, introduced in 1997, may have stealth on its side, but it can’t match the B-52’s 8,800-mile range or 70,000-pound payload capacity. In the earliest years of the Cold War, there usually was at least one B-52 airborne at all times. Later, the plane flew missions over Vietnam and during the Gulf War. They bombed Yugoslavia in 1999 and, more recently, flew sorties over Afghanistan and Iraq. And as old as it is, the Air Force expects the venerable plane to remain in service for at least another 35 years. So it’s time they got an upgrade. 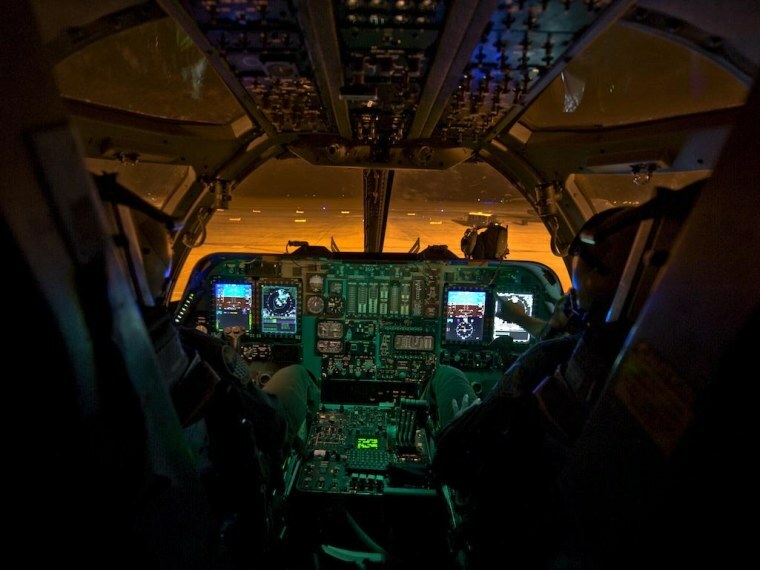 In April, the Air Force began the four-year process of fitting its fleet of 76 B-52s with Boeing’s new Combat Network Communications Technology (CONECT) system. For the first time, B-52 crews can easily retarget weapons and change mission parameters while airborne. They can see intelligence data overlaid on maps shown on high-def LCD screens. And the plane’s myriad communications, targeting and navigation systems can receive data electronically, rather than having it relayed by radio and entered by hand. The previous communications system, which got a minor upgrade in the 1980s, worked well enough for past missions, but the evolving role of the B-52 on the world stage requires new capabilities. President Obama is shifting much of the military’s might away from the Middle East to the Pacific Rim. More missions flown over an enormous ocean places new importance on the B-52’s intercontinental capability. “CONECT helps the B-52 remain a viable, flexible weapon system supporting the needs of COCOMs [combatant commands] and our nation as we react to a rapidly changing world,” said Michael Schenck, B-52 CONECT program manager for the Air Force. The program started in 2005, and Boeing delivered a B-52 equipped with the system to the Air Force for testing purposes in 2009. Last month, the first CONECT-equipped B-52 entered service. The system will be installed as planes come in for regular maintenance at Tinker Air Force Base in Oklahoma City, reducing the cost of the upgrade. It is expected to take four years to outfit all 76 airplanes. According to a March 2014 budget request, the Air Force plans to spend $14 million on the project this year, and a total of $40.6 million between 2014 and 2019. While the hardware that makes up CONECT isn’t revolutionary, it’s new for the B-52, said Jim Kroening, Boeing’s B-52 development programs manager. Kroening started working on the bomber in 1980 and spent 18 years working on the plane. Among the new tech: B-52 crews get QWERTY keyboards or keypads with trackballs. A digital system will replace the analog interphone panels crewmembers once used to talk to each other. Crews have the option of carrying programming and recording data (like maps) on and off the plane via a removable solid state storage device—what the rest of us call a thumb drive. The ability to receive digital data while in the air is especially important. Before the upgrade, changing the targeting coordinates for a bomb, for example, required having someone in air operations command convey the new information to the crew by radio. Someone on the plane then “fat fingers”–that is to say, types–the data into the targeting system, Koening said. CONECT allows digital transmission of data, machine to machine. That prevents errors and speeds up the process, especially for “smart weapons” that fly complicated routes after being launched. CONECT makes it far easier to change objectives while airborne, a big advantage in an airplane that routinely spends 14 hours aloft. LCD screens make complicated information easier to understand. And the system runs Windows, which cuts down the learning curve and can allow crews to do things like use Microsoft Word to write reports during lulls in the flight. Going forward, CONECT provides the foundation for all sorts of upgrades. It’s compatible with digital video formats. The Air Force is considering replacing the B-52’s mechanically scanned radar array with something more modern, which CONECT would support. The potential changes Boeing’s system offers the B-52 are endless, Koening said, limited only by imagination—and the military’s pocketbook.